Shaffer said two senior sources who were part of the investigation, told him that a forensic review of his computer showed that Bergdahl intended to travel to Uzbekistan. According to the sources, data collection at the time indicated Bergdahl made contact with an Afghan in an effort to lay the ground work for his departure. “He had Afghan contacts and he was actually trying to offer himself up with the Taliban. Both are very severe,” Shaffer added. Shaffer said that the NCIS investigation, which included interviews with squad mates as well as Afghans working outside the wire, reportedly resulted in Bergdahl being charged with misbehavior toward the enemy. So – not to belabor the point – – – 5 Taliban Commanders for this “not all there” traitor who actively sought warm relations with the enemy and turned his back on his friends. What is the Obama Doctrine, after all? : Warm relations with adversaries and cool them with friends. Count the mistakes: Helping overthrow Muammar Qaddafi in Libya, leading to anarchy and civil war. Pressuring Husni Mubarak of Egypt to resign, then backing the Muslim Brotherhood, leading now-president Sisi to turn toward Moscow. Alienating Washington’s most stalwart ally in the region, the Government of Israel. Dismissing ISIS as “junior varsity” just before it seized major cities. Hailing Yemen as a counterterrorism success just before its government was overthrown. Alarming the Saudi authorities to the point that they put together a military alliance against Iran. Coddling Recep Tayyip Erdoğan of Turkey, encouraging his dictatorial tendencies. Leaving Iraq and Afghanistan prematurely, dooming the vast American investment in those two countries. As always, the question is: is Obama failing, or succeeding? As Glenn Reynolds keeps pointing out, that depends on what he is trying to achieve. Posted in Bowe Bergdahl, Commies, COVER-UP, Fox News, GWOT, ObamaFAIL. Ralph Peters: Where’s The Left’s Sympathy For Soldiers Who Died Or Suffered Grievous Wounds Looking For Bergdahl? Lt. Col. Ralph Peters and Col. David Hunt appeared on Fox News, Thursday night to discuss the Bowe Bergdahl desertion charge, with Eric Bolling filling in for Sean Hannity. Peters passionately decried the left’s argument that Bergdahl suffered enough at the hands of the Taliban while he was in captivity. “His desertion led to far more American deaths and wounding than you’ve heard so far,” Peters began. Posted in Bowe Bergdahl, Fox News, GWOT, Islam, ObamaFAIL. Both Republicans and some Democrats have been saying since the Bergdahl/Taliban 5 swap was announced last May, that the Obama administration had violated the law by going over Congress’s heads. Talking heads have wondered what/who made the White House think it had the authority to make the deal without giving Congress the required thirty day notice. Congress’s investigative arm, the GAO recently ruled that the Obama administration actually violated two different laws when it traded five Taliban commanders for the deserter Bowe Bergdahl without consulting Congress. At a Senate Armed Services Committee Hearing, Thursday, it was finally revealed who made the terrible decision – it was the Holder Justice Department. Speaking to the Senate Arms Services Committee, defense official Brian McKeon was questioned on what is still a sore spot for many members of Congress: that the administration went forward with the Taliban-Bergdahl swap without giving Congress the typically required 30-day notification. Greta Van Susteren had reporters from the Washington Post and the Washington Times on Thursday night’s On the Record to talk about the revelation. Another stellar accomplishment to add to Eric Holder’s amazing repertoire of failure. Posted in Bowe Bergdahl, Fox News, GWOT, Holder, Islam, ObamaFAIL. The Pentagon has denied that Bowe Bergdahl has been charged with desertion in the wake of claims made by Lt. Col. Tony Shaffer on Monday’s edition of the O’Reilly Factor. “A decision was made,” he insisted. Pentagon Press Stooge John Kirby went on Fox and Friends, Wednesday morning to deny that charges have been brought to Army Sergeant Bowe Bergdahl. Rear Admiral John Kirby told FOX and Friends today that any delay in charges against Bowe Bergdahl were not politically motivated. Rear Admiral John Kirby: I don’t know how he (Bergdahl) has been given charges when he hasn’t been charged with a crime yet. There have been no charges filed against Sgt. Bergdahl. Nor would we ever, before charges were filed against a service member, give him a heads up, “Hey, here’s what’s coming.” That’s just not the way the process works. We’re just not there yet. Brian Kilmeade: Why would it take ten months to put together something we were able to ascertain in three interviews? Rear Admiral John Kirby: So an investigation was done after we had a chance to talk with Sgt. Bergdahl. This is a very thorough confidential investigation… I can tell you right now. I am absolutely certain, General Milley has made no decisions about what he’s going to do with this case… General Milley has complete freedom to take his time with this. He’s under no pressure whatsoever. Steve Doocy: …The Pentagon says in the public interest, people are interested in this and you should act transparently. So how about a timeline on how the Pentagon is going to proceed with this? Rear Admiral John Kirby: Well, we want to be careful we don’t put deadlines on General Milley. Steve Doocy:All the facts are in. The technical. The operational. The legal facts are all in. There’s no reason the general can’t make his decision now. Elizabeth Hasselbeck:You put deadlines on war? Rear Admiral John Kirby: First of all, this is a big investigation. General Milley wasn’t in Afghanistan, at the FOB, Forward Operating Base, where Bergdahl left so, he has to avail himself to all the information. He hasn’t gotten completely through this investigation himself. Uh-huh. Something tells me it’s going to take approximately two more years for General Milley to make a decision. Clearly, Obama expects to “run out the clock” on this scandal as he has on so many others. History will not be kind to Generals and Rear Admirals who went along with this Regime’s destructive and abhorrent schemes. Posted in Bowe Bergdahl, Fox News, ObamaFAIL. The Army came to this decision months ago, but the White House has been stonewalling the announcement because the decision to trade five dangerous Taliban commanders for one weaselly American deserter makes Obama look weak and foolish. To put it mildly. Reportedly, Assistant National Security Advisor Ben Rhodes (of BenghaziGate fame) is behind the stonewall. “The army has come to its conclusion and Bowe Bergdahl will be charged with desertion,” Mr. Shaffer said. Sgt. Bergdahl left his unit in Afghanistan without permission in 2009 and was captured by the Taliban, and held prisoner by the group for five years. Following the much-criticized exchange, the Army conducted an investigation into his actions, which concluded three months ago. Mr. Shaffer also accused the Obama administration of trying to keep the detail of Sgt. Bergdahl’s charges hidden. It’s likely the White House never expected the fierce blowback it got after the deal was announced, last June – apparently hoping no one from Bergdahl’s unit would speak out about Bergdahl being a deserter – which they did almost immediately. Now they’re stuck with egg all over their faces after publicly celebrating the worst prisoner swap in the history of prisoner swaps. The White House is squirming…Shaffer repeated the phrase “titanic struggle behind the scenes” several times throughout the interview. Posted in Bowe Bergdahl, GWOT, Huh!, ObamaFAIL. A decision is expected “fairly soon” on whether the Army will court martial Bergdahl for deserting his post in Afghanistan, or has cleared him, in which case he could receive back pay in excess of $200,000. Moreover, a decision to clear Bergdahl may well open the door for him to be designated a former prisoner of war, ensuring him substantial monthly pay, medical and educational benefits for the rest of his life. Army Gen. Ken Dahl, who conducted the investigation, has certainly been under pressure to do it right. So too is Army Gen. Mark Milley, who, based on Dahl’s findings, will make the ultimate decision on whether to charge Bergdahl. Both generals know that the White House is watching them closely, as is America, and as are military servicemen and women worldwide. Very closely. And we can guess what the White House wants. 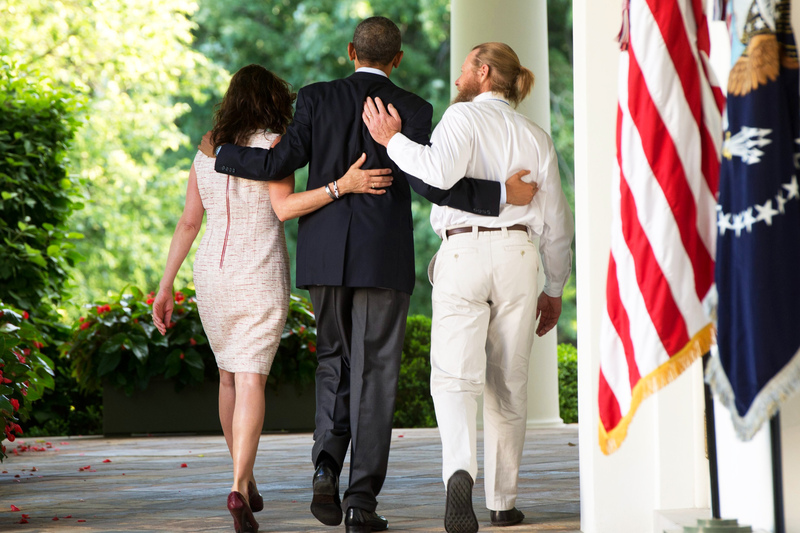 In White House terms, not charging Bergdahl means that he was indeed worth the trade for the Taliban Five. But charging him on any level means that releasing the five Taliban was an error of monstrous proportions, one the administration will never be able to explain away satisfactorily. Watch for the announcement, in all likelihood on a Friday afternoon. If Bergdahl is charged, the administration will hope it’s old news by Monday. If he’s not charged, it will be big news for a long time to come. Shaffer went on to say that his sources tell him that the report validates in greater detail the original report that was done within months of Bergdahl walking away from his post. Obama does not want to overhaul his foreign policy, it’s doing perfectly fine in his estimation, and perhaps it’s just the ideal time to empty out Gitmo and reach out to Communist Cuba. Posted in Bowe Bergdahl, Commies, FAIL, GWOT, Islamofascists, ObamaFAIL.